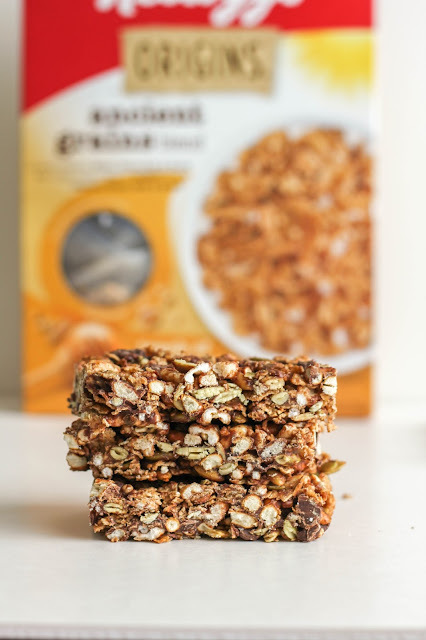 Nutritious cereal, chocolate chips, and pumpkin seeds come together to make a delicious, healthy, and portable breakfast! This post is sponsored by Vocalpoint and Kellogg’s Origins. All opinions are my own. I'm all about fast, healthy, and delicious breakfasts during the week. Although I'd love to make my kids a huge meal before we head off to school and work, it just doesn't happen. I can barely get us out the door on time, much less spend a lot of time in the kitchen! I love foods that are portable and can easily be taken on the go, like breakfast bars, fruit, even a waffle sandwich. Basically anything that is hand held! 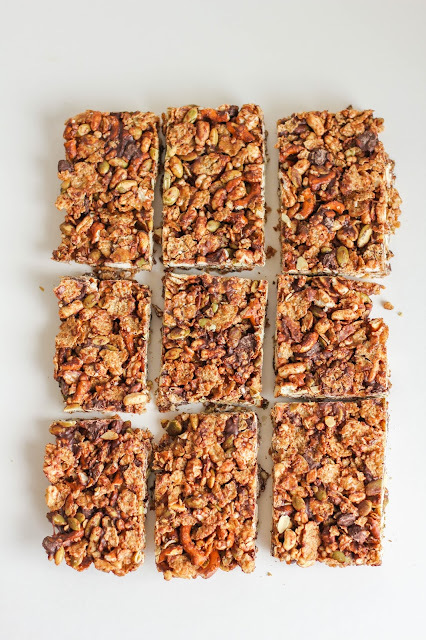 I enjoy making homemade granola bars and breakfast cookies, and try to make a batch at least once a month. I also love to make cereal bars, using different mix-ins to change things up. 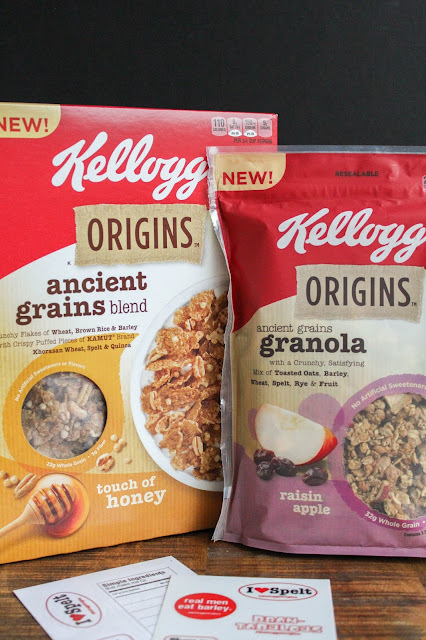 I recently tried a couple of new products - Kellogg's Origins™ Ancient Grains Blend Cereal and Kellogg's Origins™ Raisin Apple Granola - and I absolutely fell in love with both of them! The granola is the perfect topping for my yogurt, and the cereal is crunchy, slightly sweet, and just all around delicious. What I love most about these products (in addition to their deliciousness!) is how good they are for you. Every Kellogg's Origins™ cereal, granola and muesli is made with wholesome ingredients, including blends of ancient and traditional grains, fruits, nuts and seeds. I mean, what's not to love about eating real food like that? And it's something to feel good about feeding your family as well! Since I love the Ancient Grains Blend Cereal so much, I decided to whip up some No Bake Cereal Bars so that we can take our cereal to go. 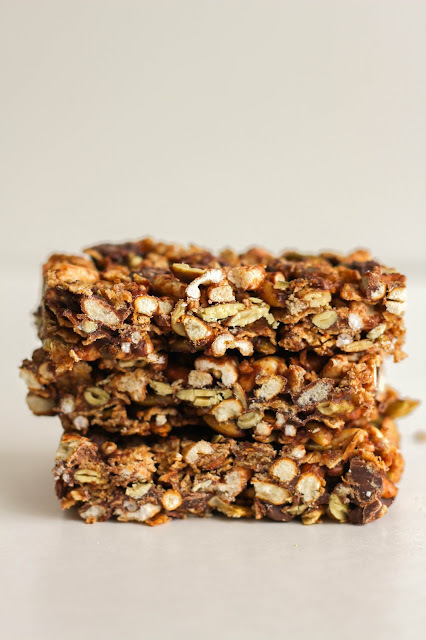 Combined with pumpkin seeds and chocolate chips, they are the perfect combination of salty and sweet. My kids were all over these bars and couldn't get enough! I wrapped them individual in plastic wrap so that they were ready to go and could easily be picked up as we walked out the door. Are you ready to try these healthy cereal bars for yourself? Line the bottom and sides of 9 x 13 baking pan with foil. Spray the foil with non-stick cooking spray. In large bowl, mix the cereal, pumpkin seeds, chocolate chips and pretzels. In a small pot over low heat, add the brown sugar, honey, butter and salt and cook until mixture is melted and the brown sugar has dissolved. Pour the warm mixture over the cereal mixture in the bowl, stirring until evenly coated. Using a spatula coated with cooking spray, press the mixture firmly into the pan. Refrigerate about 1 hour or until firm enough to cut. Cut into 16 bars, and store covered at room temperature up to one week. Are you excited to try the new Kellogg’s Origins products? Thanks to Vocalpoint and Kellogg’s Origins, ten (10) lucky winners will win a Kellogg’s Origins Gift Pack of their very own! Enter below for your chance to win, and good luck!